If you were a teenager in the 1980s as I was, then John Hughes’ The Breakfast Club was almost like the 12 Angry Men of your generation. Hughes, who had previously directed the mushy but successful Sixteen Candles (1984) and would follow-up this one up with Ferris Bueller’s Day Off (1986) wrote and directed this middle film in his “teen trilogy” and handed a generation of kids a nearly perfect fish bowl on those awkward high school years struggling to both create an individual identity and to fit in. “You see us as a brain, an athlete, a basket case, a princess, and a criminal. Correct?” That’s how The Breakfast Club begins with the voice over from Anthony Michael Hall’s “brain” Brian Johnson reciting the opening line from his essay he has written for his fellow Saturday detention detainees for principal Mr. Vernon (Paul Gleason) and what follows is a character study of these teenage archetypes – “the athlete” Andrew Clark (Emilio Estevez), “the basketcase” Allison Reynolds (Ally Sheedy), “the princess” Claire Standish (Molly Ringwald), and “the criminal” John Bender (Judd Nelson). Thrown together for various ‘crimes’ committed in school, the disparate high school students find themselves in an unwanted predicament and falling into the usual school hierarchy, popular girl Claire and jock Andrew at the top of the heap, eccentric Allison and nerdy Brian at the bottom, and John off on his rebellious own railing against everyone. But as they find common cause in standing up against the callous Mr. Vernon and begin to reveal to each other certain personal anecdotes, they begin to realize that perhaps they aren’t so different. They are each trying their best to fit in and not be, for lack of a better word, a loser. Teen films often fall by the wayside. They may be popular amongst their target audience for that fleeting moment where the kids are young and impressionable, but then they lose their appeal. The Breakfast Club is one of the few of the genre that is transcendent. While looking back on it through older eyes one definitely sees it from a different perspective, that there are perspectives to see it from gives it an advantage. It is not just teen fodder, but a film that gives an honest look at the teenage experience at that moment in the mid 1980s. Hughes would never quite strive for that sort of emotional depth again in his films as either a writer or director, but we’ll always have this film to look back on. Left to right: Anthony Michael Hall, Molly Ringwald, Emilio Estevez, Ally Sheedy, and Judd Nelson in the Breakfast Club. Photo courtesy of the Criterion Collection. This digital transfer of The Breakfast Club was created in 4K resolution on an ARRISCAN film scanner from the original 35mm camera negatives. It arrives on Blu-ray from the Criterion Collection in an AVC 1080p encodement that looks as beautiful as the film ever has. After what seems like a rough start with the opening Univeral Pictures splash screen and opening credits looking pretty soft and full of source damage. After that things really clear up and the film looks clean, crisp, and filmic with a thin layer of grain, natural color and wonderful contrast. The original monaural soundtrack was remastered from the 35mm DME (dialogue, music and effects) track. Clicks, hiss, thumps, hum, and crackle were manually removed using Pro Tools HD and iZotope RX. Additionally, a DTS-HD Master Audio 5.1 remix is included. Both tracks are clean and intelligible. The mono mix is a little boxy, but has good punch. The 5.1 adds just mild atmospherics through the surround channels while the dialogue and effects remain in the front with a mostly narrow stereo field. As always, the Criterion Collection packs this release with a hefty dose of high quality special features including commentaries, interviews, and archival features. Deleted and Extended Scenes (1.33:1; 1080i/60; 00:51:39) – A selection of scenes cut from a 150-minute rough cut of The Breakfast Club. Today (1/33:1; 1080i/60; 00:09:42) – This excerpt from a 1985 episode of NBC’s Today features host Jane Pauley interviewing actors Molly Ringwald, Judd Nelson, Anthony Michael Hall, Emilio Estevez, and Ally Sheedy. Describe the Ruckus (1.78:1; 1080p/24; 00:12:13) – This new video essay by the Criterion Collection features actor Judd Nelson reading from director John Hughes’ production notes for The Breakfast Club. This American Life (1.78:1; 1080p/24; 00:15:13) – In this episode of Chicago Public Media radio program This American Life, host Ira Glass interviews actor Molly Ringwald about what happened when she watched The Breakfast Club with her daughter, and, for the first time, saw the movie from the point of view of the parent, not the teenagers. One of John Hughes’ finest moments as a writer/director, this enduring classic from 1985 stands the test of time and remains a highly watchable film for teens and adults. The Criterion Collection release looks and sounds gorgeous. 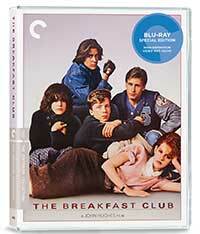 John Hughes' 1985 teen dramedy classic The Breakfast Club focuses on five teenage archetypes forced together to serve Saturday detention -- the brain (Anthony Michael Hall), the athlete (Emilio Estevez), the basketcase (Ally Sheedy), the princess (Molly Ringwald), and the criminal (Judd Nelson) -- who through their mutual dislike of their principal and revealing personal admissions about themselves find they have more in common than they knew. This new 4K restoration from Criterion offers a beautiful, filmic picture with natural colors and clean, crisp details.